Walter died in his room at the Connemara Hotel in Madras. He and his wife, Elsie, had arrived there on December 23, 1971 to see Baba, who was in Madras to preside at an All-India Conference of Sai Organizations. Early on the morning of December 25, a rumour quickly spread that an elderly American had died of a heart attack. My wife, Victoria and I immediately thought of Walter. We went to the hotel and found Elsie (Walter’s wife) there. Walter had fallen to the floor in the early morning hours. Elsie had called Mrs. Ratanlal whose room was just down the corridor. The two women managed to lift Walter to the bed, and he passed away in Elsie's arms a few minutes later. An ambulance was called, The body was taken to a hospital, pronounced dead upon arrival, placed in an empty, storage room, and covered with a sheet to await daylight and decisions about the funeral. 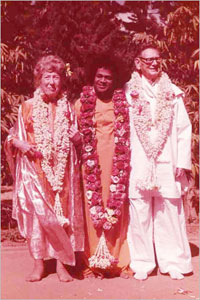 Elsie and Mrs. Ratanlal had already been to see Baba when we arrived. He had told them He would visit the hospital at 10 a.m. The two ladies were ready and waiting to join Baba at the appointed hour. They did go to the hospital, but Baba had arrived earlier and had already departed. To the joy of the ladies, but also to their total amazement, they found Walter alive and being attended to. Nobody saw Baba with Walter, nor has Baba chosen to say how or why Walter was resurrected, but on returning to the devotee family who were his hosts, Baba told the people there that He had brought Walter back to life. Walter's own story throws some light on what happened, and later on, I was a party to a fascinating episode; for Walter's life continued to be in danger and, in fact, Baba told me that Walter died three times and had to be returned to life three times. Walter described his experience. He said he realized that he had died and that he had remained with the body, in the ambulance, looking at it with interest. Then Baba came and together they went to a place, which seemed to be at a great height. There they entered a conference room where people were seated around a table. There was a presiding chairman who had a kind face and who spoke in a kindly way. He called for Walter's records and these were read aloud. The records were in different languages and Walter did not understand what was said until after some time when Baba started to translate. Walter was surprised to hear that he had occupied a lofty status in various times and cultures and had always been dedicated to the welfare of the people. At length, Baba addressed the person presiding and asked that Walter be given over to Baba's care, for Baba had work for Walter to do. Then, when Baba and he departed the room, Walter felt himself descending towards a place where his body was, but felt great reluctance. In terms of direct experience, he had realized that he was not the body, and he had no wish to be subject again to anxieties and miseries. After hearing Walter, I asked Baba if Walter was just imagining the incidents. Baba replied that it was not imagination. They had occurred in Walter's mind and Baba himself had guided the thoughts. I then asked if everyone had a similar experience at death. Baba answered that some people had similar experiences and some did not. Several years later, I brought up the question again. Baba answered that the corpse was common to all, but beyond that there was no common experience. The day after Walter returned to life was one of high interest for me. Sri Appa and I accompanied Baba to the home of a devotee. From there we went to a meeting of lady members of the Nigara Sai Samithi where Baba was to give awards and speak. Sri Appa and I were sitting on the platform, just a few feet from Baba, and were able to observe him closely. He made the awards and gave a spiritual discourse, all without any break or any moment of hesitation. From that meeting, we were to go to the home of a devotee for lunch. As soon as we got in the car, Baba turned to us and said, "While I was talking in the meeting, Mrs. Cowan called me. I at once went to the hospital and did what was necessary. Mr. Cowan's health had taken a turn for the worse." So, even while busy on the speaker's platform, Baba had gone to the hospital, and had done what was necessary. But, to the eyes of Sri Appa and myself, Baba had continued in action and speech on the platform for the whole time without any break or hesitation whatsoever. How does one explain this mystery? When we arrived at the devotee's house for lunch, Baba turned to us and said, "You will not be able to join me for lunch. Take this Vibhuti to the hospital, give Mr. Cowan some in his mouth and rub the rest on his forehead and chest. If you will walk to the corner there, you will find Mrs. Hislop in a taxi. She will take you to the hospital." Now the fact was, that my wife had been following in a car. However, she had taken great pains to stay out of sight, but her effort was to no avail for, as usual, Baba knew everything. When we reached the hospital with the Vibhuti, Mrs. Cowan said, "Walter took a very bad turn just a little while ago. I thought he was dead, and I was terrified. I at once called Baba in a loud voice. Now, Walter seems a little improved. When I called Baba I felt his presence at once." At the hospital, Elsie experienced exactly what Baba had told Sri Appa and myself in the car. Other instances of Baba's powers of resurrection are also known. The Raja of Ventagiri told me how some twenty or so years ago, he had witnessed Baba's resurrection of a man dead some six days in whom body decomposition was taking its normal course. About these mysteries, one can make no comment; they are outside one’s common experience. Reference: “My Baba and I” by Dr. John Hislop. Page: 28-31. Publisher: Birthday Publishing Company, San Diego, California, 1985. Copyright now with Sri Sathya Sai Books and Publications Trust, Prasanthi Nilayam.